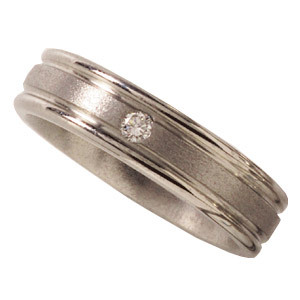 Ti™ titanium wedding band. Polished finish with rounded edges. Domed center. .07CT round diamond. Diamond color F, clarity SI1-2. Ring width: 6mm. Hypoallergenic, comfort fit styling. Limited lifetime guarantee: All Ti™ jewelry is guaranteed for life. If a piece should EVER fail structually, it will be replaced at no charge. Product is exact to picture shown. Beautiful quality, a piece that can be worn with anything on any occasion. My husband I have matching set and as masculine as it may look it has a very femanine touch to it while its being worn. Craftsmanship is stunning and strongly made. Much recommended.